Checking out the Phil & Ted's Travel Cot for the first time. It's gotten a LOT of use since then! Holiday travel in your plans? Wondering how on Earth you’re going to deal with the crowds, the cramped flight or the long car trip with baby / toddler/ kids in tow? We’ve got you covered! From tips on how to keep baby busy to where to have your toddler sleep while away we have lots of suggestions and travel tips to help your holiday travel with little ones go smoothly! If you’re traveling with baby this season and wondering what to bring to ensure your trip goes smoothly, be sure to check out our Top 10 Items to make Travel with Baby Easy and Fun. We have you covered with ideas on the best travel stroller (the UppaBaby GLite), the best baby carrier (carries toddlers comfortably, too! ), and the best travel diaper bag. Our Top Ten Baby Travel Toys will keep your little ones busy whether you’re flying or driving this holiday, and won’t drive you crazy with annoying music or break the bank, either! One thing we don’t recommend getting that you might be considering is a booster seat/high chair. Here are our thoughts on Travel High Chairs and Why We Don’t Use One. If your little one is a bit bigger, our tips on toddler travel toys will keep your active toddler busy through long lines and longer drives/flights. As usual, all of our suggestions have been vetted by our official tester here at IanAndWendy.com – our daughter, who, at 16-months-old had 3 foreign stamps in her passport and had flown 6 times. Whether you’re little ones is a baby or a toddler, extra clothes are always a good idea and you might well want to bring an extra t-shirt for yourself, as well. The way we figure it, extra clothes are kind of like bringing your umbrella. If you don’t bring it, you’re sure to need it, and if you do, you’ll have sunny skies and smooth sailing all the way! 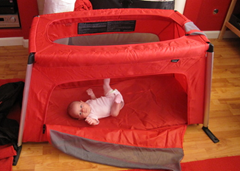 Once you get to your destination, we can’t recommend the Phil & Teds Traveller (Travel Cot) highly enough. We absolutely love ours and use it every day at home as well as whenever we travel. It was the first piece of baby equipment we chose and definitely one of the best and most useful. We’re planning on getting another one soon as we’re expecting baby #2 any day now. Wherever your travels may take you this holiday season we wish you short lines, smooth flights with extra empty seats and traffic-free roads. From our family to yours, Happy Holidays and may 2011 bring many happy new travel plans!